It's green, it's white, it's wet, then it's dry. But don't be confused. It's good stuff - really good stuff. It's what most 'ride in normal trousers' cyclists have been waiting for. 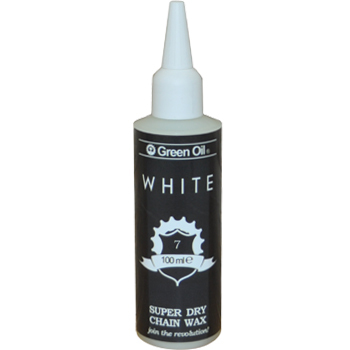 A few posts ago I mentioned that I’d just received a sample bottle of Green Oil’s new White dry chain wax to test, and I promised that I’d report back after a few weeks of usage. So here I am, a few weeks later, reporting back. I’ve been intrigued by chain waxing for a while, ever since reading about it in an old Bridgestone catalogue. In the catalogue, Grant Petersen describes the process of removing the chain, degreasing, melting paraffin wax in a pan on the stove, dropping the chain in, coating, removing and allowing it to dry before refitting it to the bike. Now I’m a huge Petersen fan and a sucker for quasi-magical processes like that, but I have to admit it seems like a time consuming way to lube your chain. (If you’re hell bent on the old-school method download the 1992 Bridgestone Catalogue and learn all manner of timeless bicycle lore). Secondly, the lingering odour of paraffin wax in the kitchen is unlikely to go down well with my co-habitants and the use of a petroleum based wax just seals the deal. So the introduction to the market of a plant-based wax dissolved in plant-based ethanol, which goes on wet and dries quickly, without requiring any use of stoves, pots, pans or magical incantations is naturally something for me to get unhealthily excited about. Before I applied the new lube, I needed to start on a level playing field so I thoroughly degreased my chain using a chain cleaning device and some citrus based degreaser, rinsed and then thoroughly dried the chain with a old rag until it shone like jewellery. Once the chain was full dry, I methodically dripped a liberal drop of wax lube onto each roller, watching the lube, which is very runny when wet, penetrate deep into each link. I continued this process until I got back to where I started from. The instructions on the side of the reuseable bottle state that you should allow at least seven (not six or eight) minutes to allow the wax to fully dry. Being a belt and braces sort of chap who carries two inner tubes and backup lighting with him at all times, I allowed the wax to dry overnight before testing the bike on the morning commute. I’m pleased to report that in the morning I was greeted with a dry, still and quiet day, which allowed me to listen out for any chain noise. Indeed, the chain was remarkably silent and upon inspection at the end of the day, the chain had retained its jewel-like appearance. However, as the saying goes, one dry day’s riding maketh not a full chain lubricant test. So I continued to schlep about for the rest of the week on dry days, wet days and one day plying the muddy lanes and gritty bridleways around Ladybower Reservoir. Good news is that the chain remained silent, even after the mistreatment of getting a through dousing with no post-ride wipe down. It’s still impressively clean too. In fact, this very morning something unplanned occurred which proved just how clean my chain remains – I accidentally dropped a white t shirt that had been airing on the banister rail above the bike. The t-shirt plummeted in slow motion down into the hallway below, landing, according to the unbending rules of Murphy’s Law, on the upper run of the chain. I scurried downstairs imagining a ruined t-shirt (which belonged to my wife) and thought I’d have some explaining to do. But when I plucked the garment off the chain, there was not a mark to be seen. Impressive indeed. In fact, when I reapplied the lube this morning, there was no need to degrease the chain at all, just a thorough wipe-down was required before adding more lube; a good thing in my opinion, because too frequent degreasing can strip lube out of the inner surfaces on the rollers, where it’s hard for many lubes to penetrate. The only compromise I can see here is that dry wax may not offer the same level of rust-protection as a ‘wet’ oil. However, this is easily overcome by wiping down the chain with a rag after a wet ride – a practice that I’d encourage anyway. That aside, I’d wholeheartedly recommend this product to anyone who’s sick and tired of suffering The Greasy Cuff or filthy hands when putting back on an errant chain. The product’s green credentials only add to its merits. Everything is plant-derived and the company prides itself on recycling, re-use, low carbon footprint and all that jazz. Verdict: Good job Green Oil – Highly recommended. Here’s Green Oil’s quirky but informative site. It’s a nice place to be. Thanks for the interesting review. As a long time bicyclist, I suppose the perfect chain lube is the proverbial “Holy Grail”, and I’m open to trying something that might be better than what I’m currently using. Because my time on dusty gravel roads has gone up dramatically in the last 2-3 years, it seems this product could be a good match for me. Oh yeah, if it’s not too personal a question, how about showing us that jewel-like chain of yours? Not too personal a question at all! I was indeed keen to post an image of the chain but I’ve left my good camera at work; a mobile phone shot just won’t do it justice. Tomorrow, I promise! ‘White’ will work a treat on dusty gravel roads. I’ve noticed that I need to lube my derailleur jockey wheels separately with light oil – because the wax doesn’t creep onto the jockey wheels like a wet lube does. But I suppose I should be doing this anyway. Interesting product. I’ve had poor luck with wax-based lubes (White Lightning and Pedro’s), so I’m a little skeptical. In my experiences, those products wash off very easily in the wet, and need to be reapplied too frequently in general, sometimes not even lasting an entire ride. That said, this seems like a bit of a different product. I’d be curious to read a long-term review, once you have used this for a while longer. I’ve used Finish Line’s dry lube and that barely lasted one commute before the squeak set in. Nothing like a winter of commuting on the roads of Northern England to sort out the wheat from the chaff. I think you’re right in say that it might need more frequent application (perhaps once a week) but I can live with that if it means less degreasing and a clean chain. I’ll keep you posted, for sure. Strange they don’t seem to sell it on the Green Oil site ( or I just couldn’t see it ) but Wiggle stock it,£6.29. I waxed a brand new chain using the traditional method a couple of years ago & a few months of winter salt wrecked it – my fault in part for not paying attention to the rapid deterioration. First impressions are pretty favourable – however, as you rightly point out, we’ll see how we get on through winter. How did you do after the winter? I have started to use some on my childback tandem and triplet in part because the children seem to be always getting their ankles on the chain. I have to confess to not completely cleaning the chain in advance (mixture of laziness, lack of time and suspicion that I don’t always manage to exclude degreaser/water from the links on cleaning). The chain is coming back cleaner, but I suspect it may take several cycles of lubing- riding- cleaning to really see. However, so far, better than wet lube on cleanliness front. It fared well in the winter, though I must admit that laziness forced me to use any old lube that I could lay my hands over the last few months. I plan to totally degrease my chain and cassette on the Peugeot soon, and apply White lube in preparation for the UK monsoon summer, so I’ll keep you posted on its ongoing effectiveness.